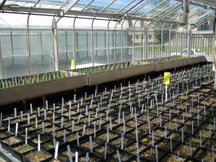 Cloning of ZmYS1 allowed the surprising but important breakthrough that genes with strong sequence similarity to ZmYS1 are found in non-grass species (monocot, dicot, gymnosperm, and moss species) that neither synthesize nor can use phytosiderophores. All these species do, however, contain a related compound, nicotianamine, an iron chelator that is structurally very similar to phytosiderophores and which contributes to long distance iron transport within the plant. Transport of iron and other highly reactive metal ions must be accomplished using relatively safe, chelated forms.